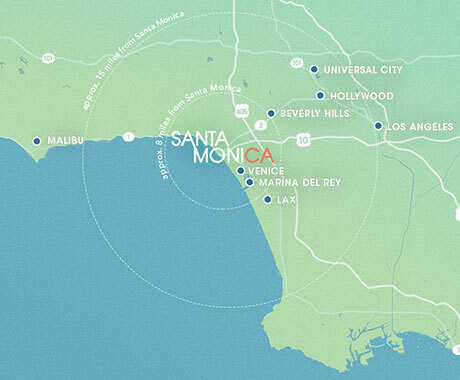 Santa Monica is the ideal meetings, events and incentive destination for groups up to 200 people. Whether setting up a small meeting, incentive group, retreat, or organizing a conference or trade event, Santa Monica has the perfect venue for your program. We are available to assist with planning and referrals. Santa Monica hotels are famous for their location, quality and service. Feel free to explore the hotel links. View Santa Monica hotels with meeting space. 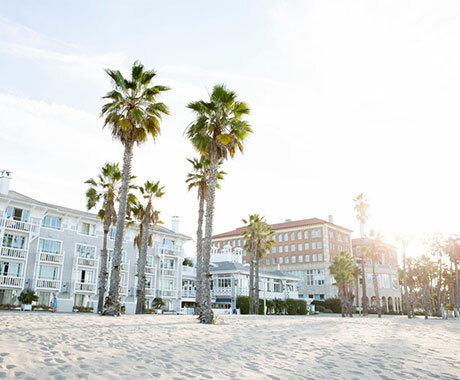 Offsite venues include a historic beach house, an airplane hangar or a seaside pavilion in the amusement park on our world-famous pier, just to name a few. View offsite venues in Santa Monica. Santa Monica offers over 400 restaurants, from casual to elegant, available to host your meeting. It is recognized for some of the best dining in all of Southern California. There are various options for offsite group dining. View group dining options that offer audio visual (a/v) or all Santa Monica restaurants. Before, during and after your meeting, Santa Monica has it all! Fill your down time with extraordinary experiences only found in Santa Monica. Browse unique group activities below and contact us at groupsales@santamonica.com for more information and assistance in planning. TASTE | Farmers Market Tour & Chef Demo: Santa Monica is home to four farmers markets. The city’s best chefs get inspiration from the country’s best farmers. You can spot local and celebrity chefs shopping for fresh, organic ingredients and join them on guided group tours and cooking demonstrations. WALK | Historical Walking Tours: Customize your group tour and enjoy more than 130 years of Santa Monica history on foot, from its Wild West frontier beginnings, architectural heritage to the sophisticated metropolis and urban landscape of today. SIP | Wine Excursions: Malibu wine country has more than 50 vineyards and is only 20 miles away. Sip award-winning California wine straight from the vineyard and enjoy spectacular sightseeing tours with knowledgeable guides for your group. LAUGH | Group Improv Experiences: Laugh out loud with your group! Custom improv classes are a fun way to get your attendees up on stage. INDULGE | Group Dine Around: Santa Monica is a leader in the local food sourcing movement. The use of sustainable, organic ingredients remains central to the cooking approaches of leading chefs around town. Discover a taste of Santa Monica’s delicious cuisine from renown restaurants to hidden treasure through group dine-arounds. RELAX | Wellness Activities: Treat your group to beachside yoga, surf lessons or relax with some of the most luxurious and cutting-edge spa treatments. SIGHT SEEING | VIP Tours: Enjoy guided tours highlighting celebrities, art, food and our world-famous beach. GOLF | Take a Swing at Nearby Courses: Although there are no golf courses located within Santa Monica, you can tee off at the closest course located less than 5 miles away: Penmar Golf Course (2 miles / 3.2 km), Riviera Country Club (2.3 miles / 3.7 km) and Rancho Park Golf Course (4.5 miles / 7.2 km).